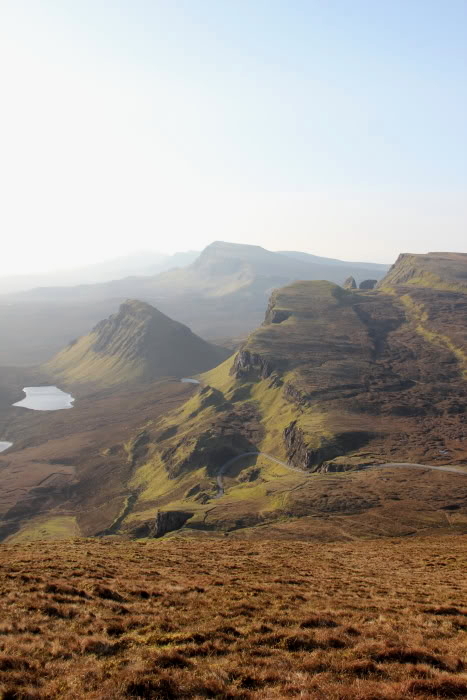 A traverse of the Trotternish Ridge has been on my wish list for a number of years. 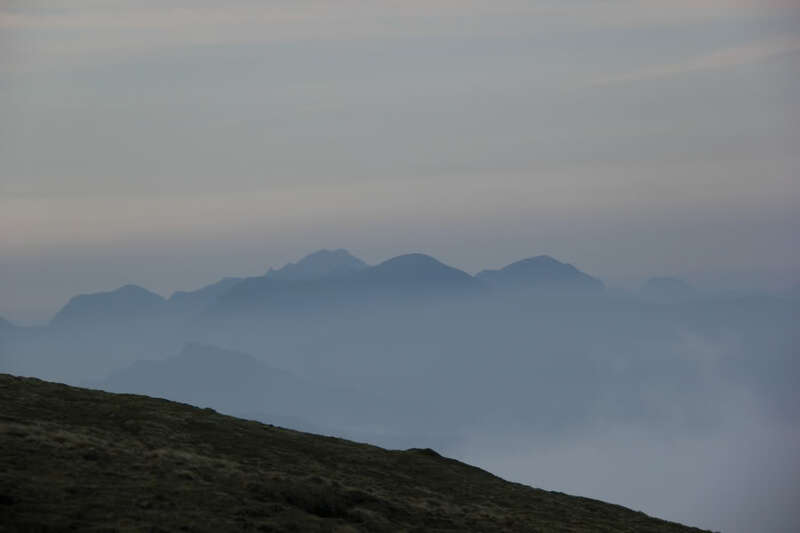 However, when the weather has been good I have always headed for the Cuillin. 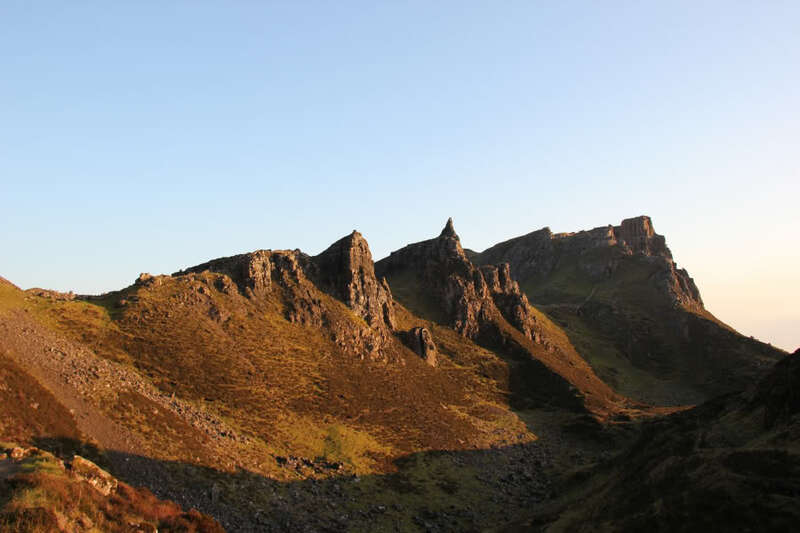 An old sage of the hills once said to me, “North Skye is not Sgurr nan Gillean.” It was time to put things right and do justice to North Skye . 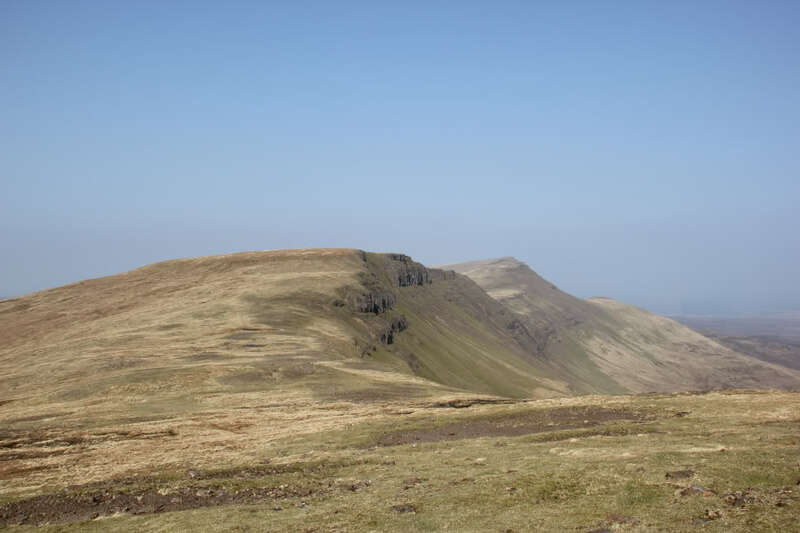 In planning for the traverse, I knew several factors had to be right: a) good weather, b) pre-midge and c) being fit. It was certainly debatable whether or not I was fit enough, however, what I lack in fitness is made up for with stubbornness and determination. Planning for the traverse also involved the debate, one long day going light or two easier days with a heavy pack. 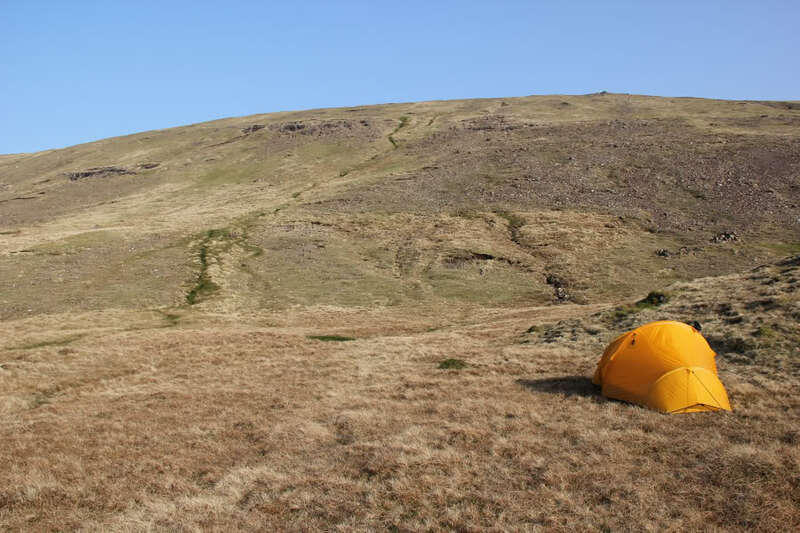 I opted for the two-day approach as I quite fancied camping out on the ridge. 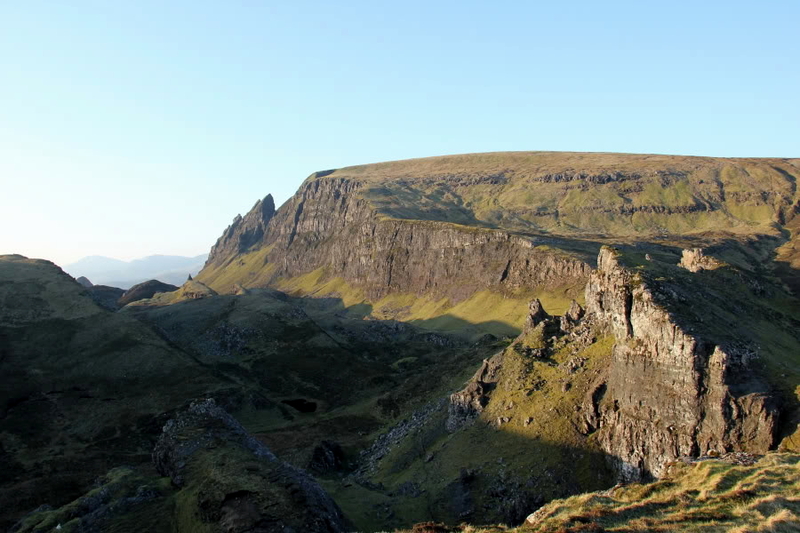 Very early on Tuesday morning, I drove to the Quiraing car park located at the high-point on the road from Brogaig to Uig. 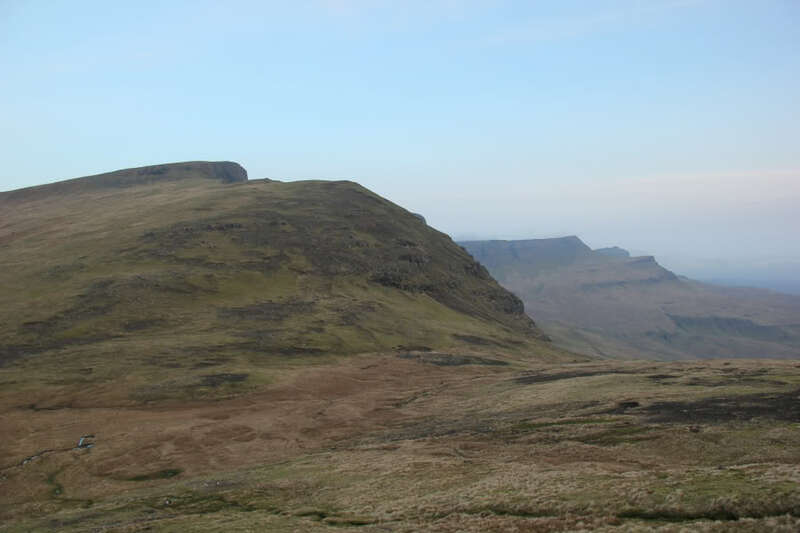 I then ascended a short distance up Bioda Buidhe where I stashed all my camping gear and three litres of water. 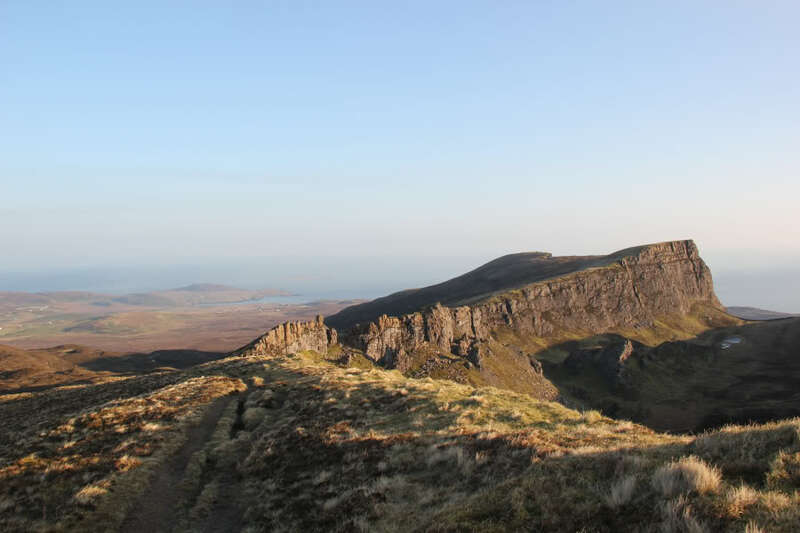 I then drove to the start of the Trotternish Traverse at Flodigarry. This allowed me to undertake the initial section with a light-pack carrying little more than 1.5 litres of water. I parked just off the main road beside the Flodigarry Hotel. I set off walking along the A855 just before dawn. 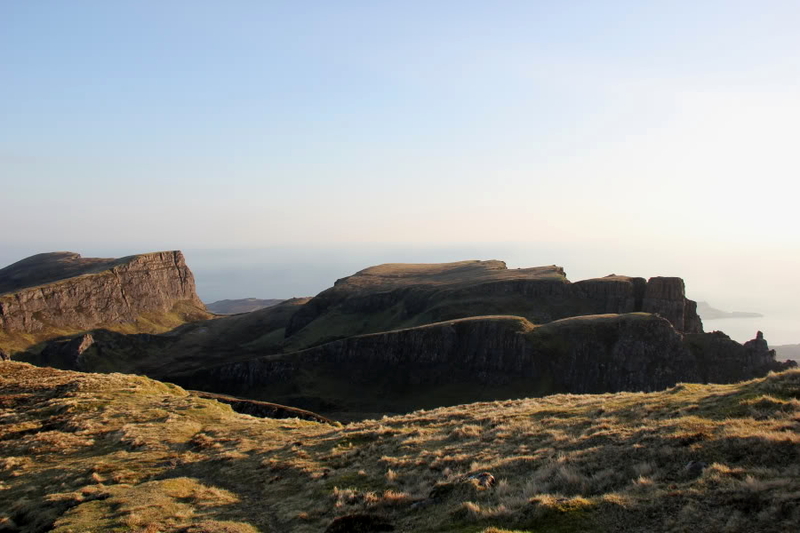 On reaching the start of the Quiraing track beside Loch Langaig, I witnessed a lovely sunrise. 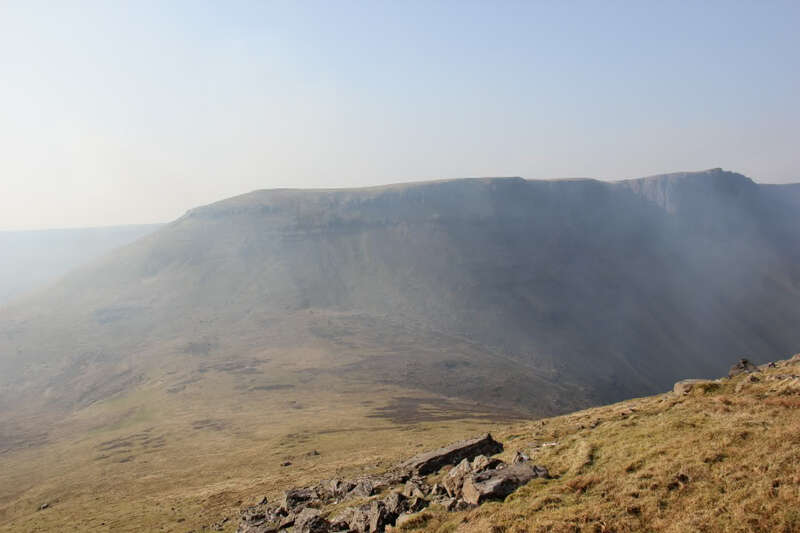 Perfect blue-skies except for some smoke from nearby heather burning. 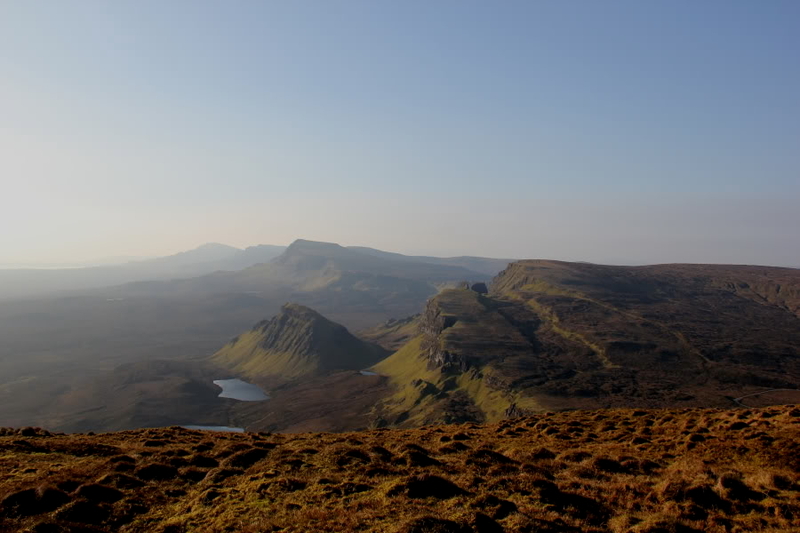 I then made my way along the track towards the Quiraing. 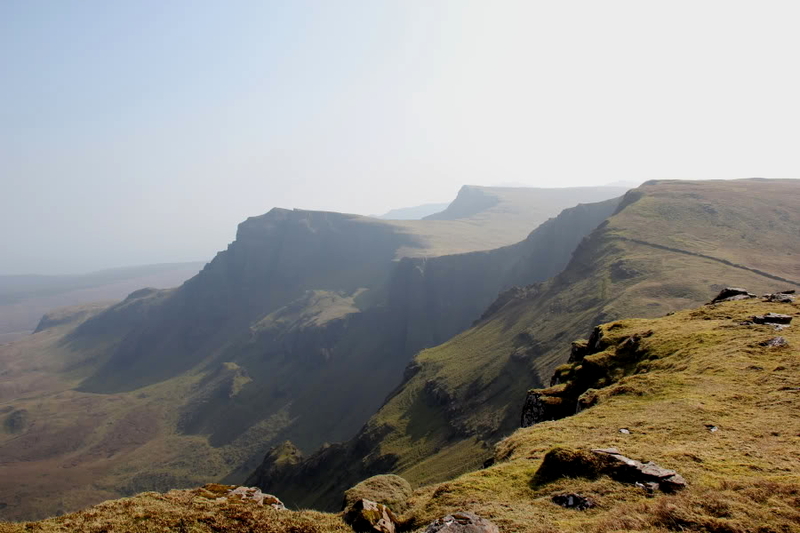 The Quiraing section was my favourite part of the whole traverse so I took, and have included, a number of photos. 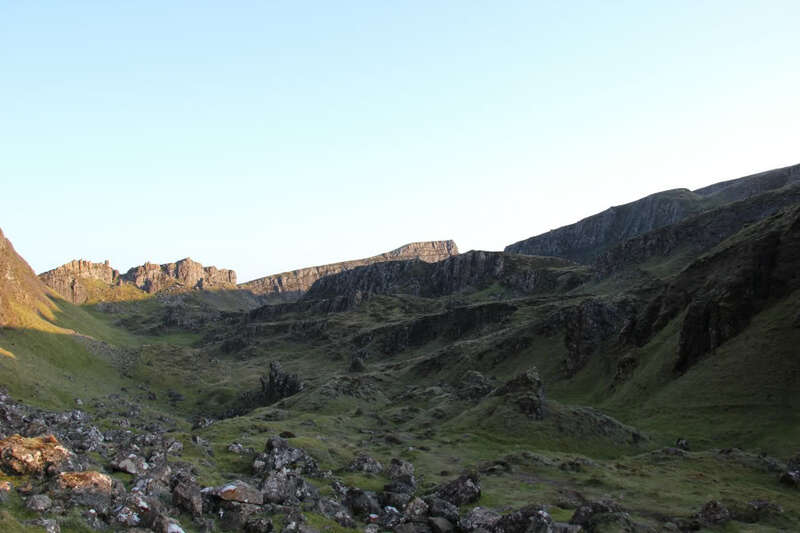 The track leading up to the ridge was pretty-good; probably the best section of path on the whole Trotternish ridge. 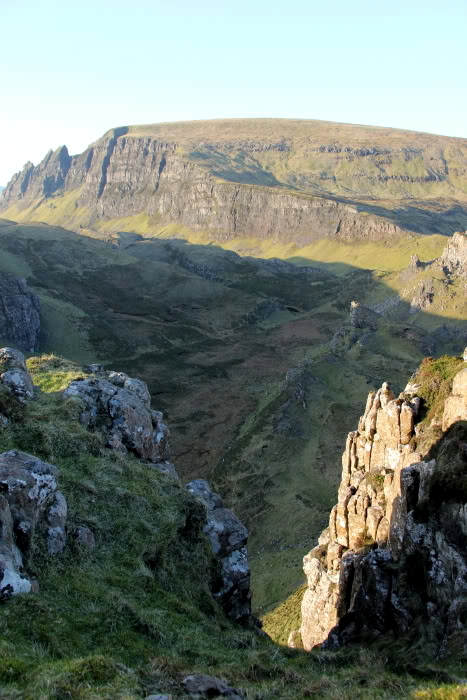 The Quiraing is worth a visit even if you’re not contemplating a full traverse. 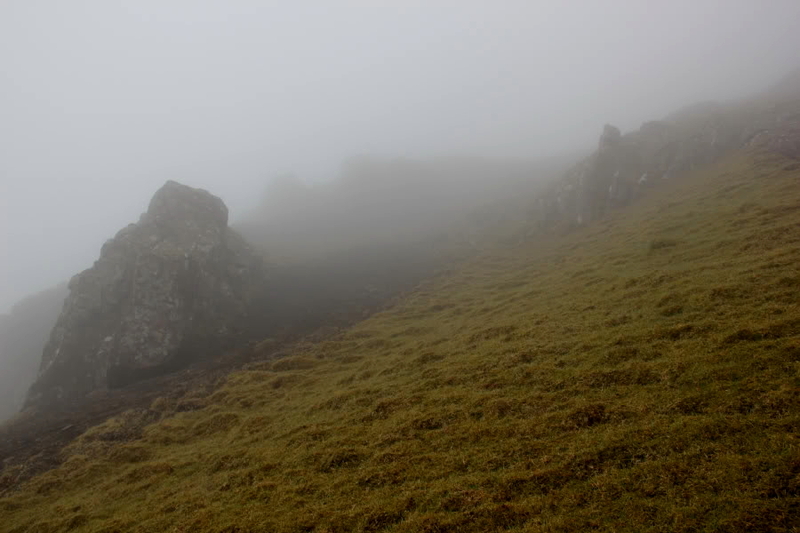 On reaching the section of path immediately below the cliff, I could see Sron Vourlinn in the distance. I was keen to start the traverse of the ridge from Sron Vourlinn. The views on gaining the ridge were really special. 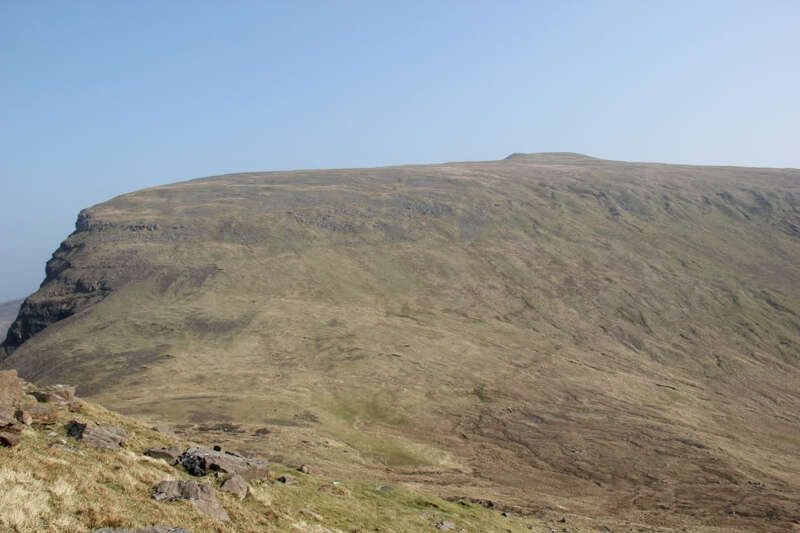 To my friends who only ascend Munros, check this out! On reaching Sron Vourlinn, I stood at its airy high-point. 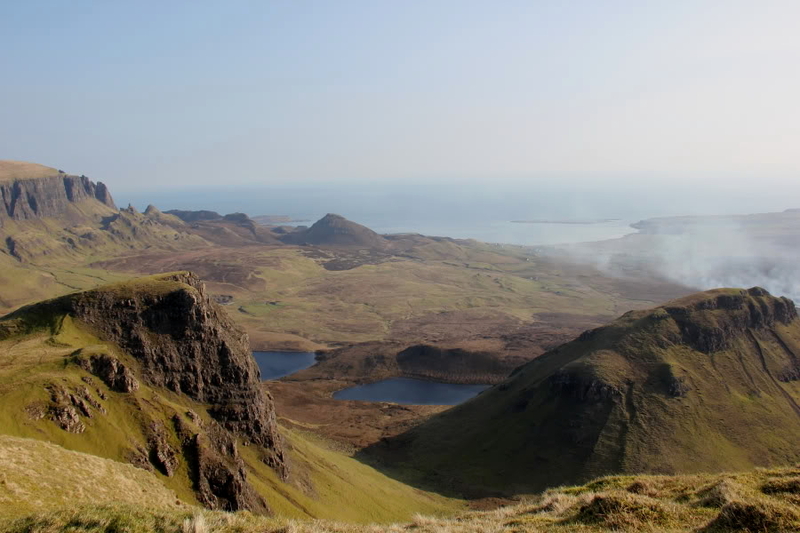 I then set off along the long traverse of the Trotternish ridge. 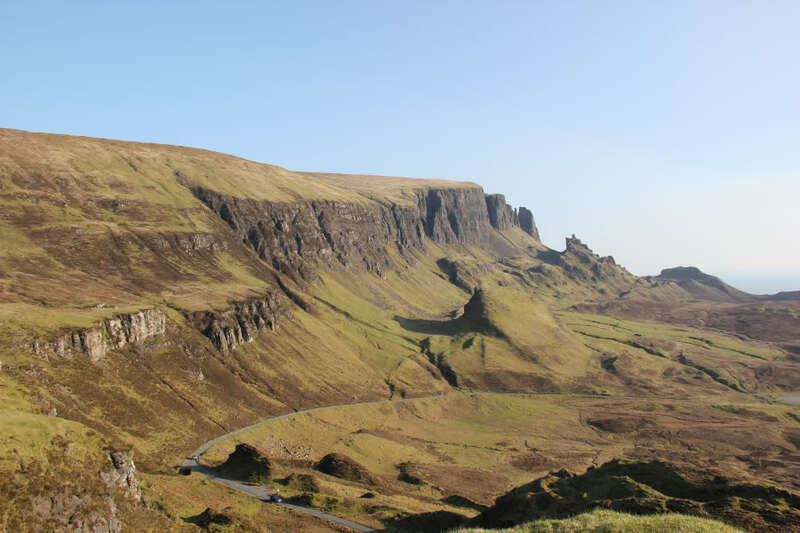 The geology of North Skye is incredible. 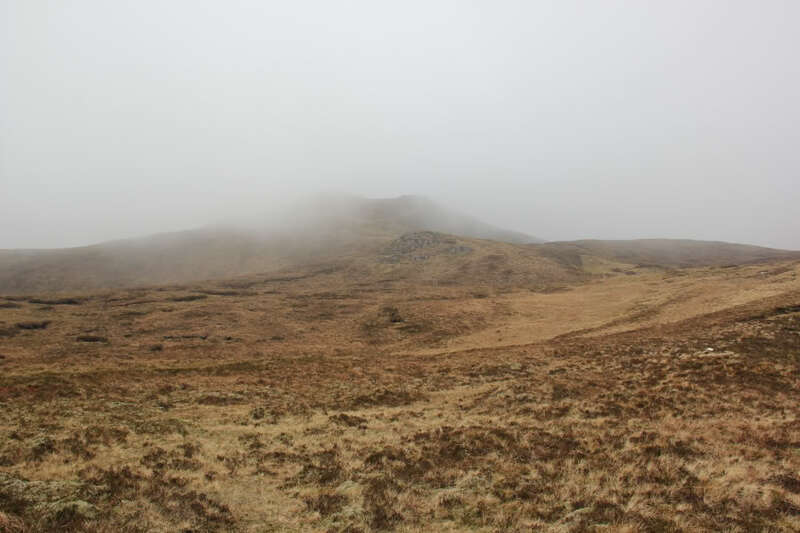 As I made my way along the edge of the cliff towards Meall na Suiramach, I was so busy admiring the views that I overshot the summit by several hundred metres. This was soon put right. 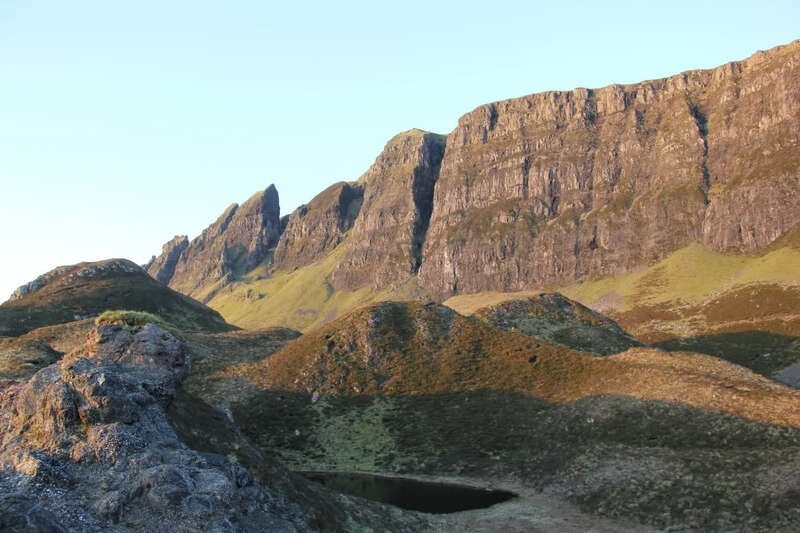 Meall na Suiramach, along with its Quiraing, is a fantastic Marilyn. 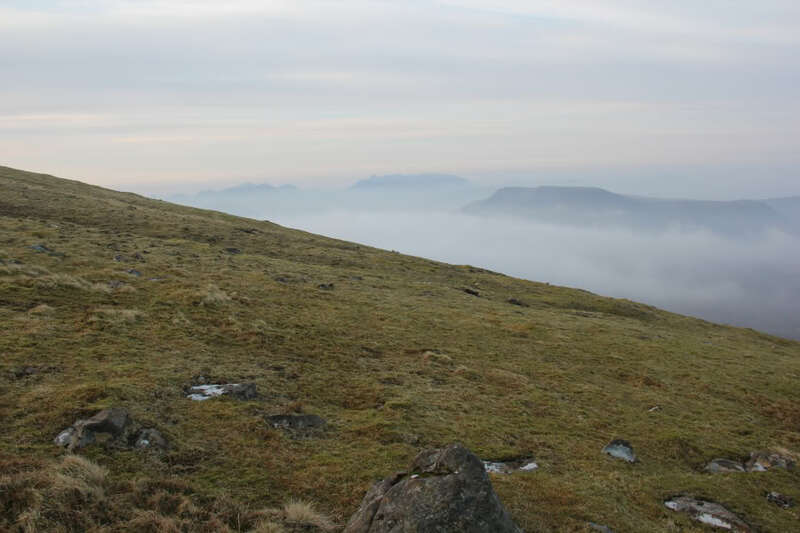 From Meall na Suiramach, I made my way towards the Brogaig to Uig road, where I intended descending to its high-point. As I made my way down towards the road, I was really impressed with Cleat. 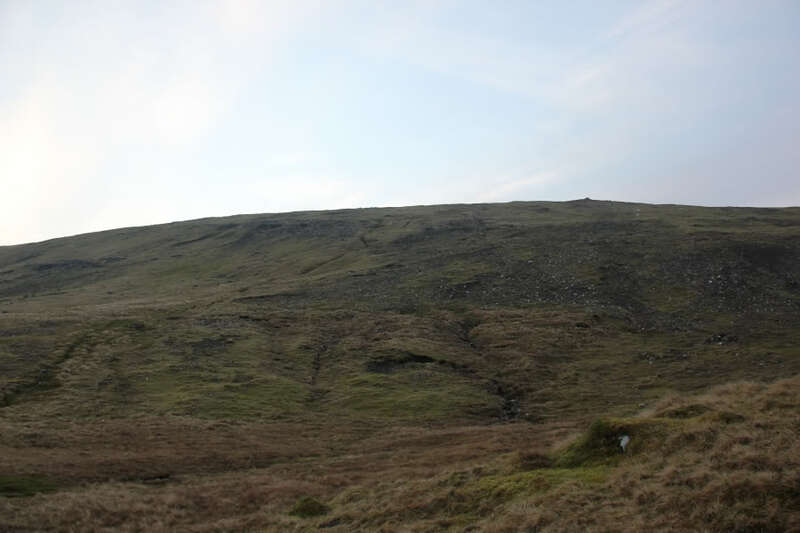 Cleat is a HuMP (Hundred Metre Prominence hill). I’m definitely coming back to climb it! On reaching the road, I stopped for a short rest before ascending Bioda Buidhe to the point where I had stashed my camping gear and water a few hours previous. The combined weight of my rucksack, camping gear, 4 litres of water, food, etc. was now circa 13kg. The first few hundred metres thereafter was a bit of a struggle but I soon grew accustomed to the weight. On reaching the grassy featureless summit of Bioda Buidhe, I traversed to below the 452m top before descending to Bealach nan Coisichean. 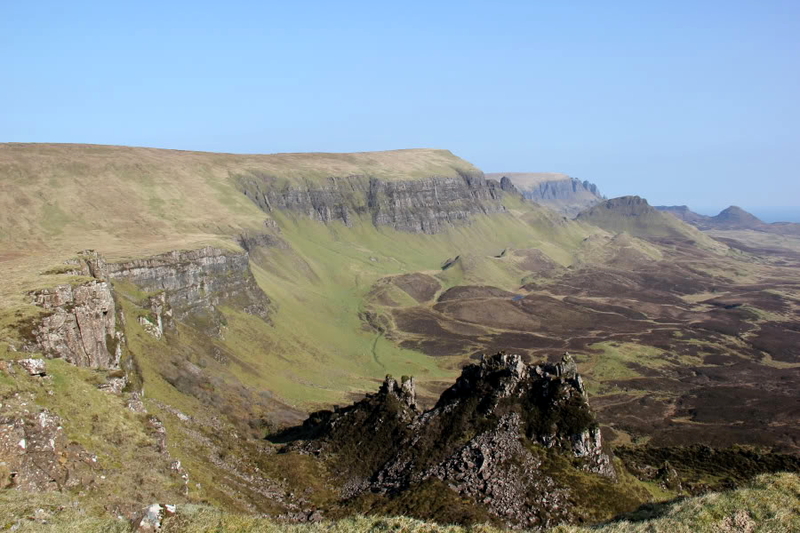 There is a large cliff directly to the South of Bioda Buidhe. 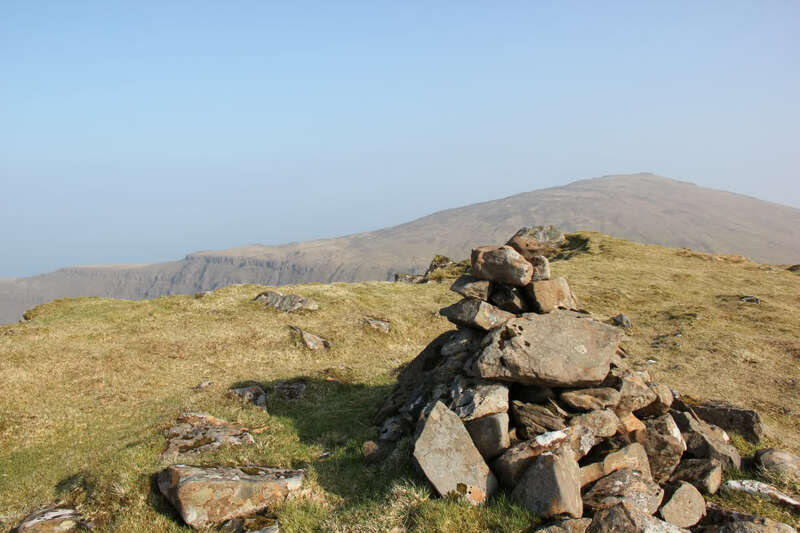 On reaching the bealach, I was a bit surprised to find the first of several burns on the ridge. 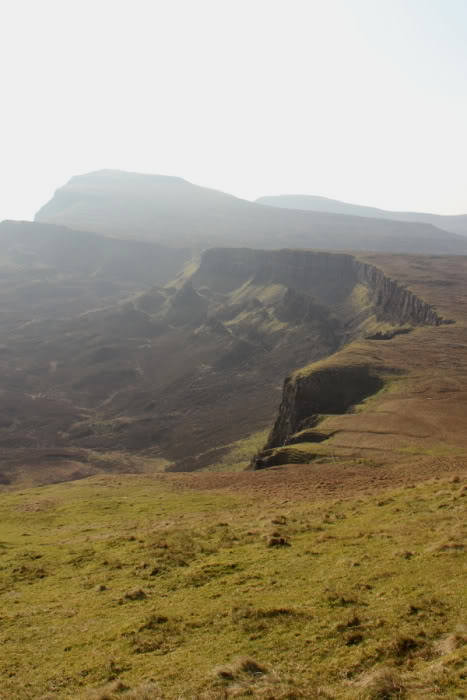 On reading up about the Trotternish Traverse, I read that there is no water on the ridge. This advice is wrong unless the burns sometimes run dry. From the bealach, Beinn Edra looked a long way off. 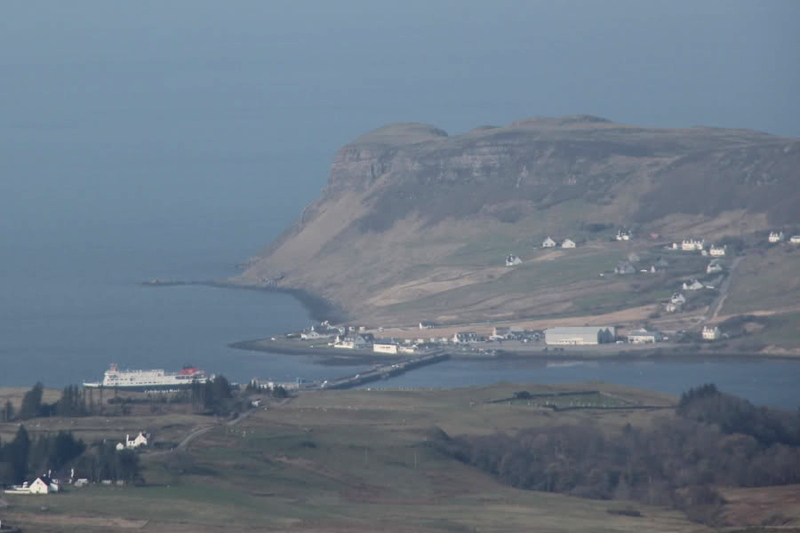 As I made my way along the ridge, I could see the Calmac ferry at Uig. 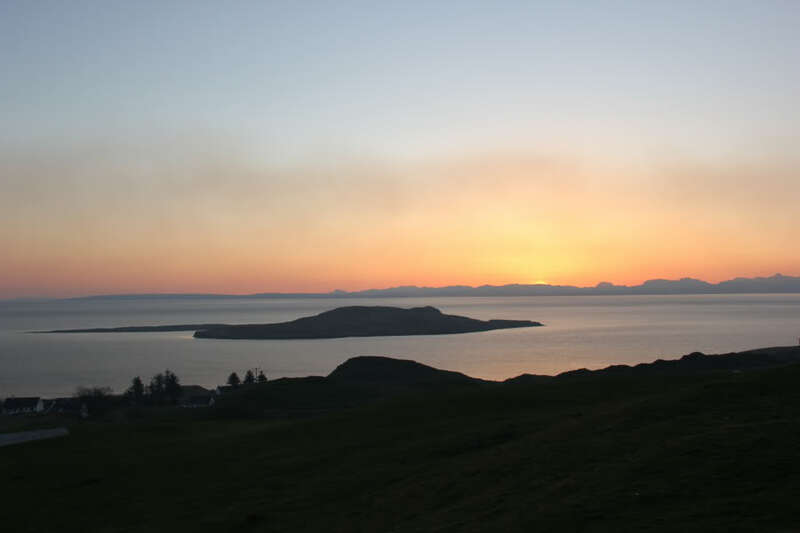 This brought back some good memories of previous trips to Harris and North Uist. The ascent of Beinn Edra was quite arduous given the heavy pack and the heat. 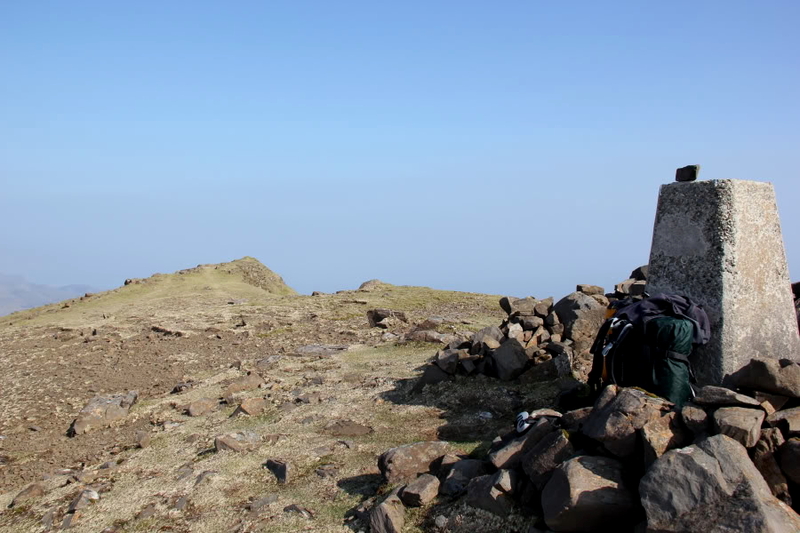 It was great to reach the summit trig point, my third HuMP and first Graham-top of the traverse. 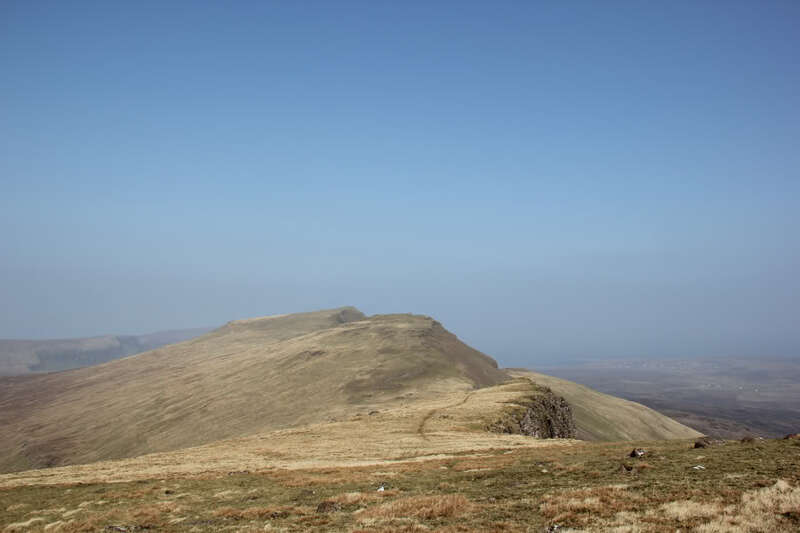 The long section of ridge from Beinn Edra (Graham-top) to Hartaval (Graham) involved lots of ups and downs including a further two HuMPs, Creag a’Lain and Baca Ruadh. The following couple of photos show how pleasant the underfoot conditions are along this section of the ridge. It was interesting to find a diagonal wall running across Creag a’Lain; it looked quite old. 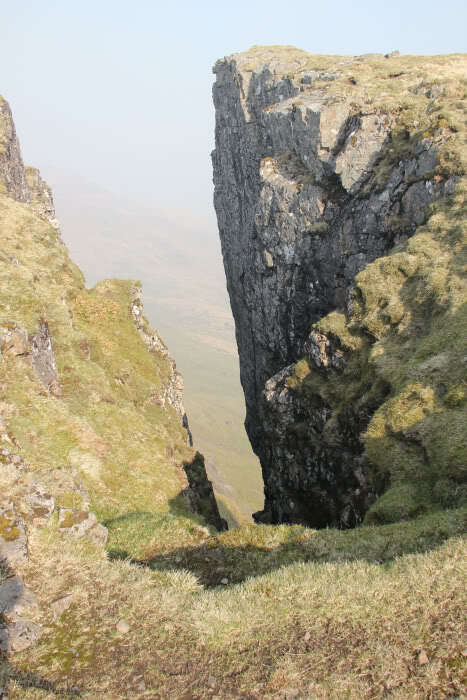 Between Creag a’Lain and Baca Ruadh there is an impressive spur called Sgurr a’Mhadaidh Ruadh. 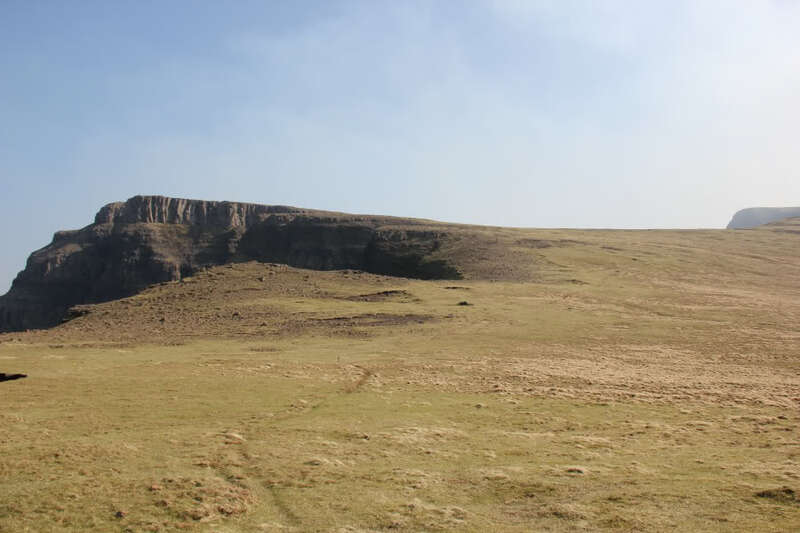 Much of the ridge consists of gentle grass slopes to the West and sheer cliffs to the East. 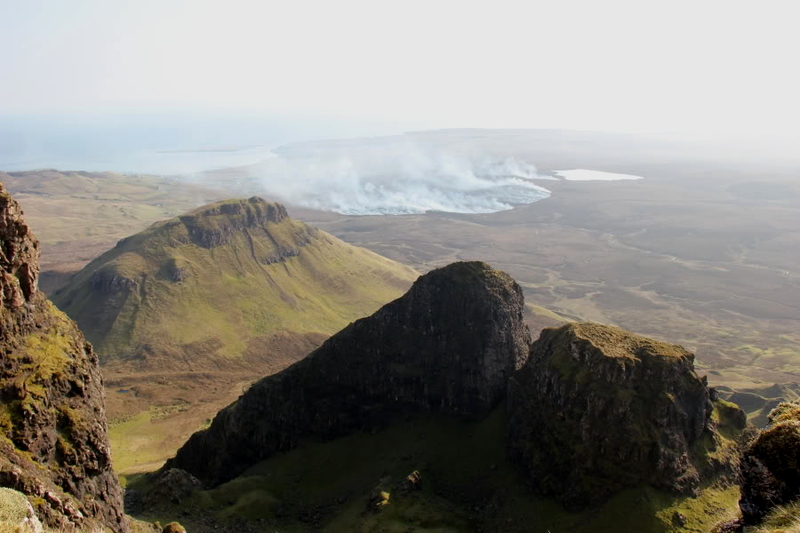 By the time I reached Baca Ruadh and its top Sgurr a’Mhalaidh, my eyes were streaming as the air was filled with smoke from heather burning. It was good to see that the ascent of Hartaval was next. I was in two minds whether to camp before or after Hartaval. Given Bealach Hartaval was dense with smoke coming up the River Romesdal glen, I opted to continue on and also ascend Hartaval. 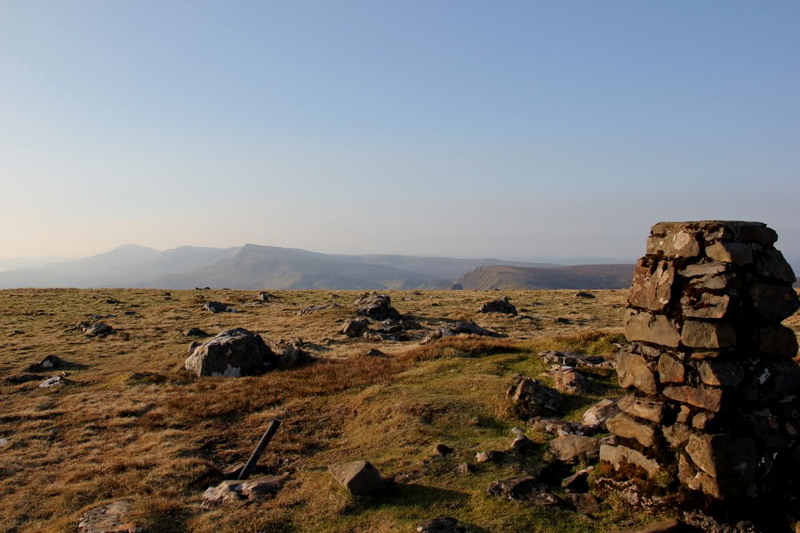 By the time I reached the summit of Hartaval, I was feeling tired and had aching shoulders. 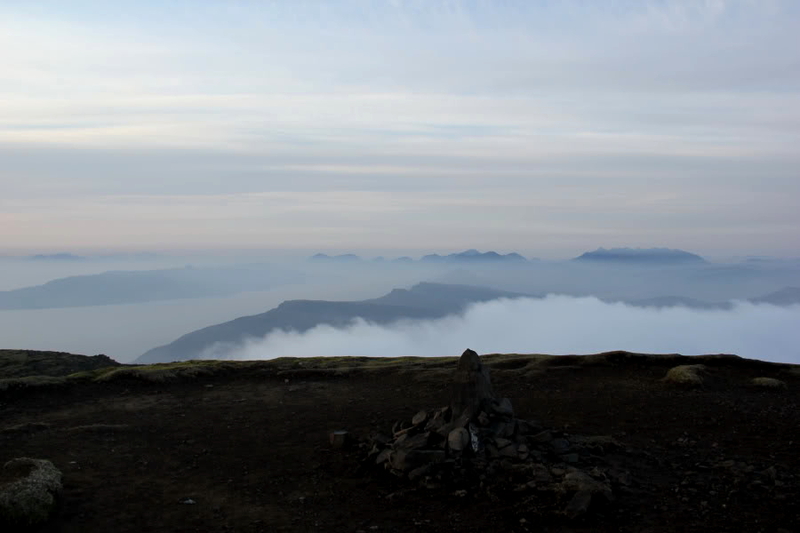 I had already ascended 1850m, so I decided to descend to the Bealach a’Chuirn and set-up camp for the night. 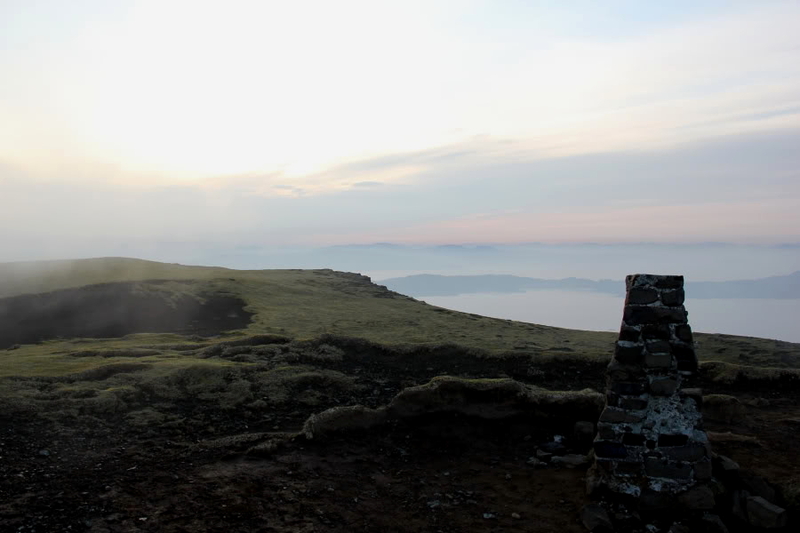 I reached the bealach at around 17:00, ten hours after setting off. After having some dinner I got into my sleeping bag to keep warm as it got quite chilly. I fell asleep around 21:00 and woke up at 01:00. On wakening, I decided to go out for a look at the stars. There were thousands if not tens of thousands of stars visible. 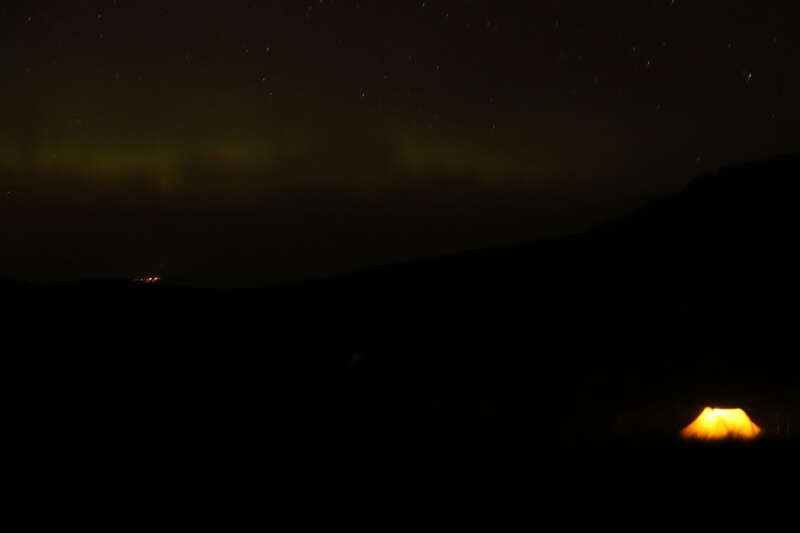 There was also a very faint glow – aurora! I switched the camera to manual, set it on the ground and took some long-exposure shots. 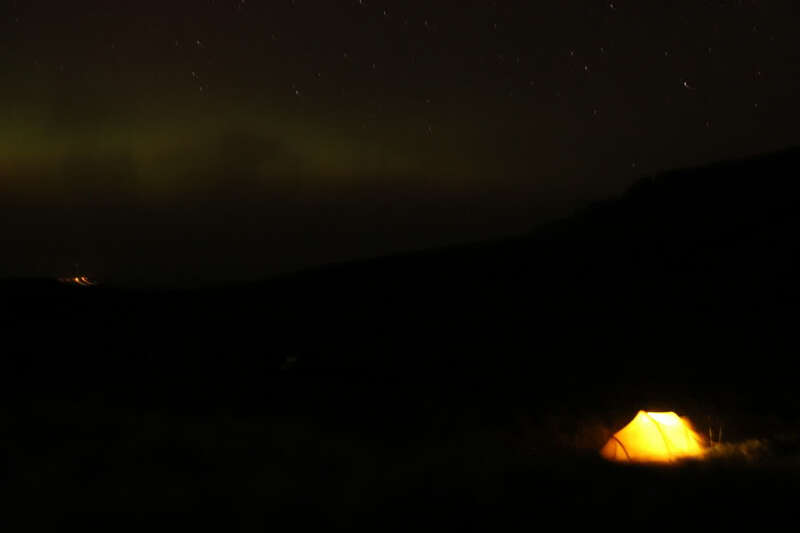 I managed to get a couple showing the tent and the aurora. I then went back to bed and slept through to 06:30. 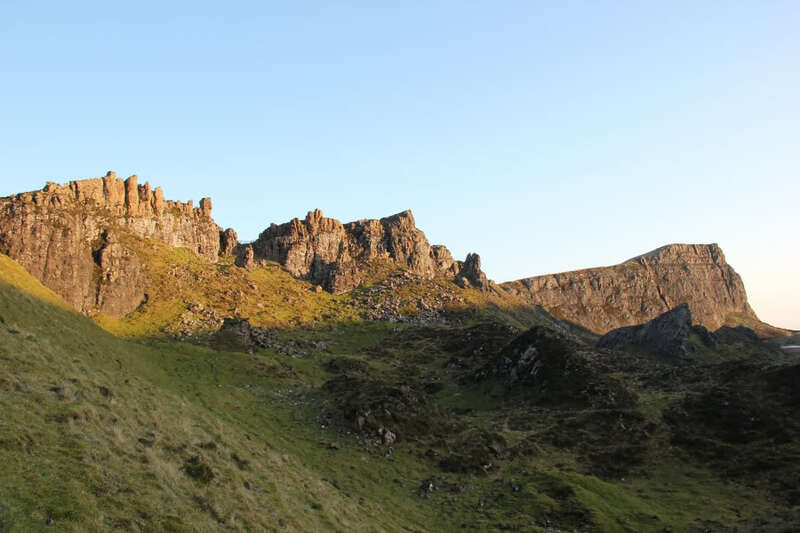 By 07:20, I had packed up camp and set-off up the Storr. 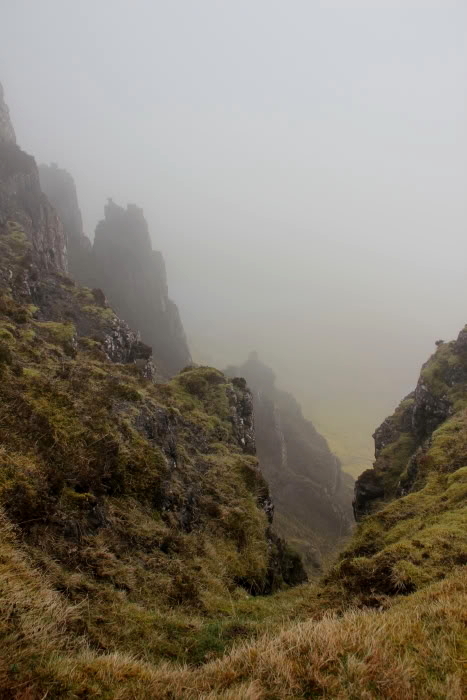 The ascent of the Storr was straight-forward. During the ascent, I was pleased to get my first glimpse of the Cuillin. 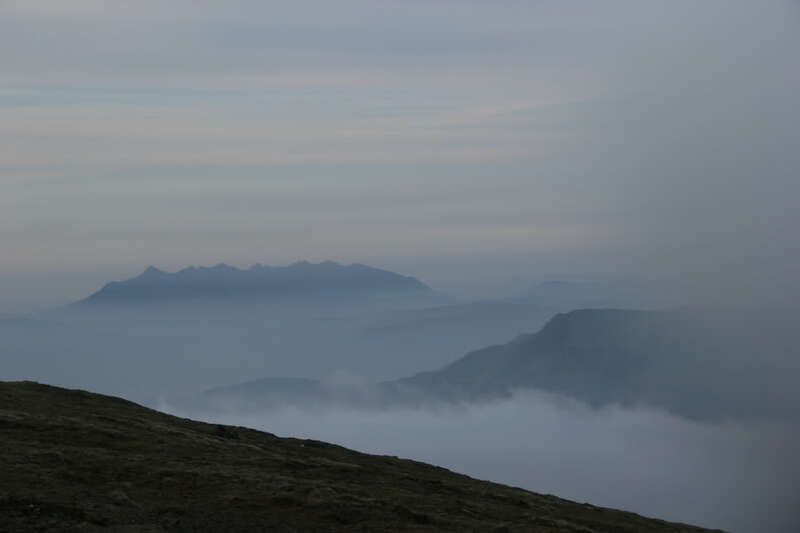 Even better, there was cloud inversion! 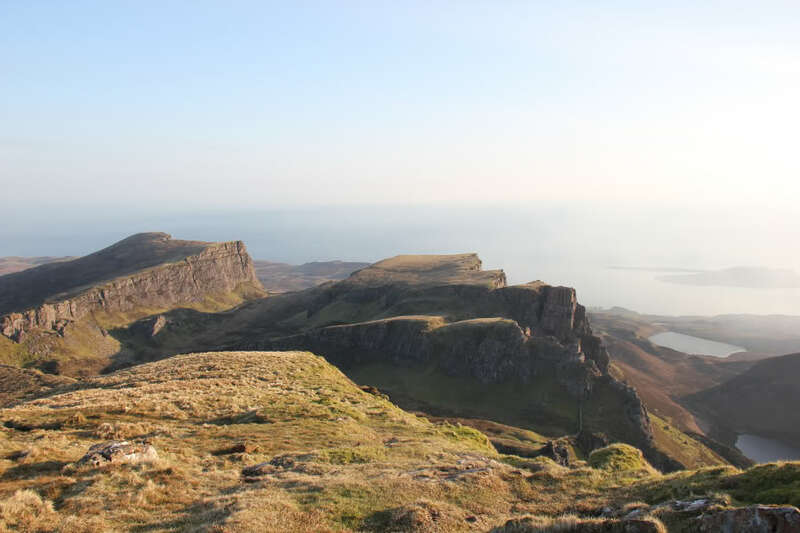 I took quite a number of photos at the summit of The Storr. 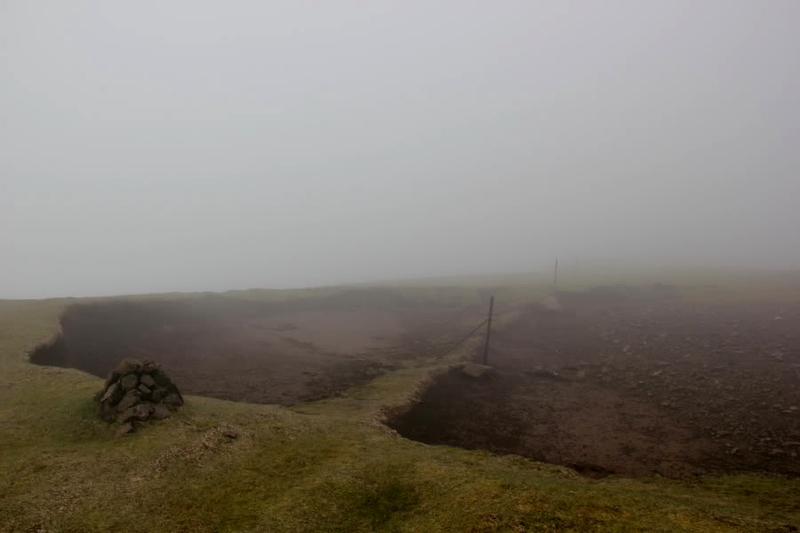 However, the downside to the inversion was soon apparent as most of the remaining walk was in cloud. 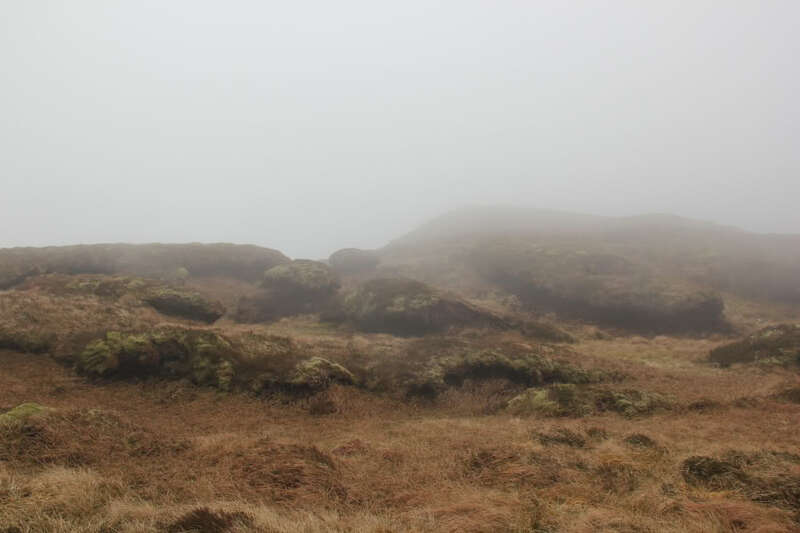 You need to take care to avoid the cliff edge if walking in clag. 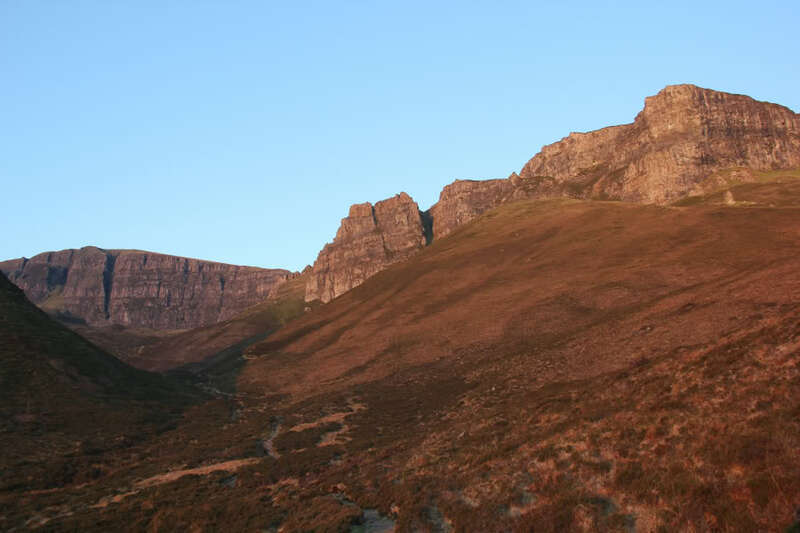 The hardest part of the traverse was definitely the final 100m of ascent of Ben Dearg. It was made more difficult by the fact that I could not see where I was going. I chose to follow a line of fence-posts which thankfully got me to the top. The descent from Ben Dearg was unpleasant. Instead of nice short grass, it was mostly peat hags and bog. 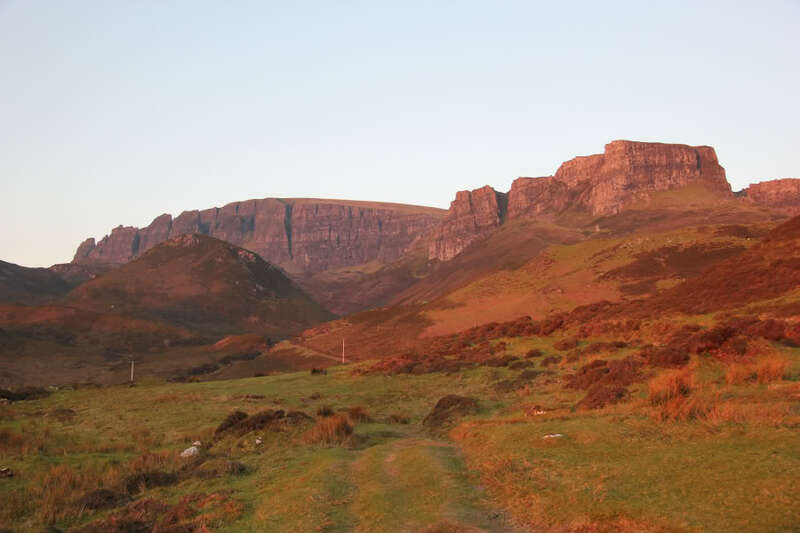 By the time I reached the bealach between Ben Dearg and A’Chorra-Bheinn, I decided to head for the road. I eventually reached the road at the 158m high-point and then walked just over 1.5km along the road to the Achachork junction. 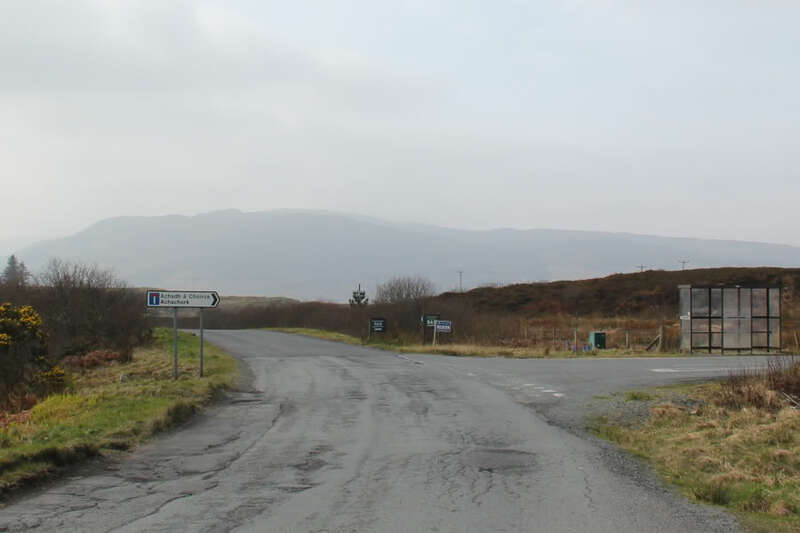 I now had two choices: a) catch the next bus back to Flodigarry (which was due in 10 minutes) or b) walk the final 1km into Portree, miss the bus and have to wait over three hours for the next one. I opted for a). 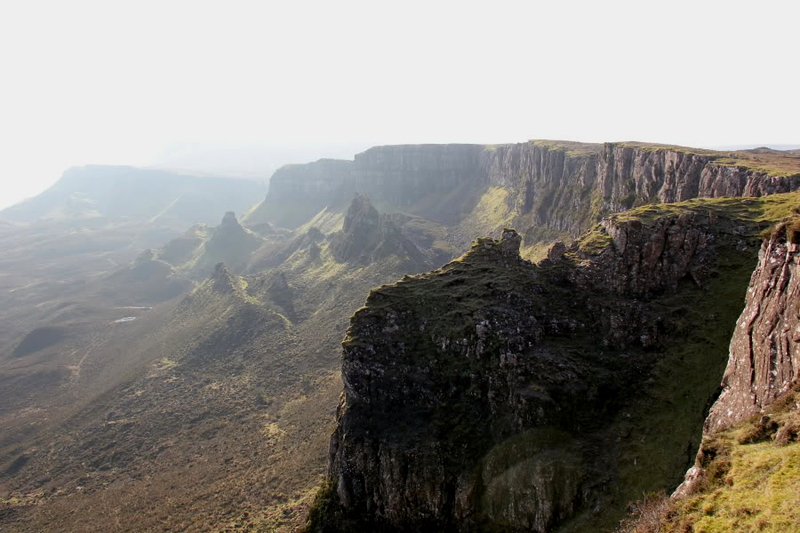 The Trotternish Ridge is quite fantastic. 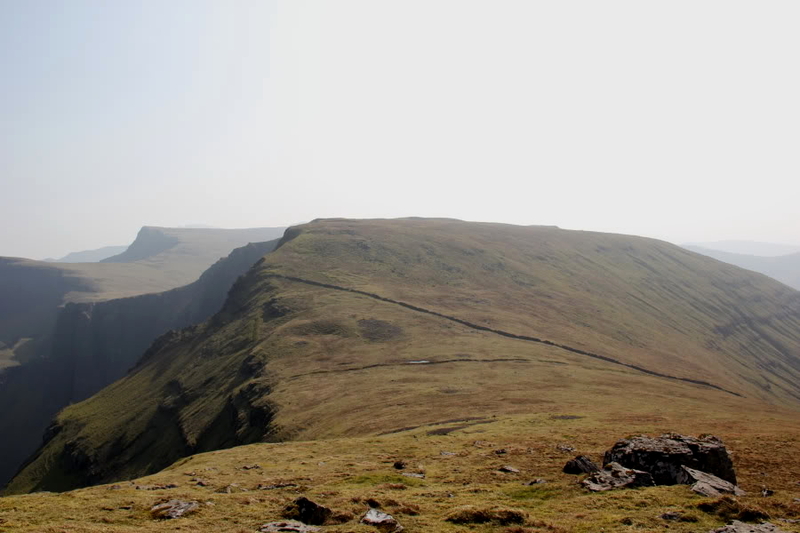 It is quite unlike any other hillwalking I have done in the UK. Highly recommended, but don’t underestimate the amount of ups and downs .